Drazil is a line of yummy, naturally caffeine-free herbal tea and real juice blends for the kids to drink. Contest Details: Enter to win from Monday, June 13 – Friday, July 8, with 10 winners announced the week of July 11-15. About Drazil: Drazil is a juice box drink, made with all-natural fruit juice, which is blended with naturally caffeine-free herbal tea and sold at many Safeway, Target and Whole Foods stores nationwide. Made especially with picky kids and conscientious parents in mind, the tea-infusion makes Drazil a great source of antioxidants, while the juice provides delicious taste, plus 100% daily value of vitamin C in each serving. Plus, the individually portioned boxes are perfect for breakfast, dinner, lunchboxes, sporting events, kids’ parties and more! Drazil Kids Tea is a line of yummy, naturally caffeine-free herbal tea and real juice blends. o Drazil Kids Tea uses a tasty herbal tea combination of hibiscus, rose hips, rooibos, pomegranate and fruit pieces that’s brewed fresh then lightly sweetened with real fruit juice, so kids can drink nutritiously and live vibrantly. 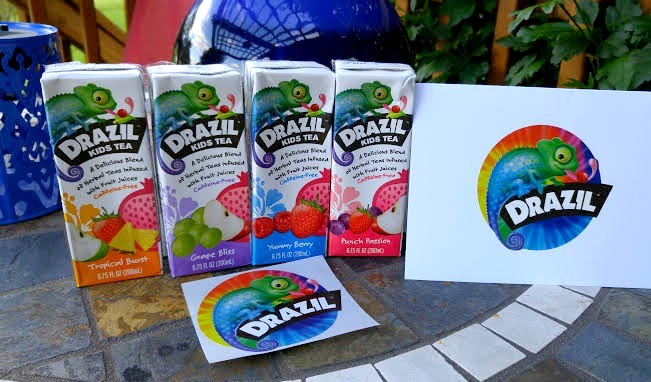 Kids of all ages love Drazil’s refreshing and delicious real fruit taste, and parents love that has 35 percent less sugar than traditional 100% juices with the added benefit of antioxidants, vitamins, and minerals infused naturally from the herbal tea itself. o Drazil Kids Tea is a delicious and convenient way to give kids the benefits of naturally caffeine-free herbal tea anytime – the individually portioned boxes are perfect for breakfast, dinner, lunchboxes, sporting events, kids’ parties and more! o All Drazil Kids Teas are a natural source of antioxidants and 100 percent daily value of vitamin C, with no added sugar, tea extracts or powders, or artificial ingredients. o Drazil Kids Tea is available in four great-tasting kid-approved flavors, including: Punch Passion, Grape Bliss, Tropical Burst and Yummy Berry. All Drazil Kids Teas start with a yummy, naturally caffeine-free herbal tea combination of hibiscus, rose hips, rooibos, pomegranate and fruit pieces that’s brewed fresh then lightly sweetened with real fruit juice, so kids can drink nutritiously and live vibrantly.